Tucked in my newsfeed between the latest pleas for coming together, opinions, and new shipments of lipsense colors was the comment: "At least Trump has integrity." I nearly missed it, and had it been in the comments of a news story, or on a heated political thread, or even remotely sarcastic, I would have. At the very least, I'd have been able to register it as laughable and move on. But it wasn't in the comments of a news story, and it wasn't on a heated political thread, and it wasn't coated in even the slightest layer of sarcasm. It came from a member of my church. The same church that lauds integrity as one of the core values that young women should strive to possess; so much so that six years are spent learning, reading scriptures, and taking on projects that will further the understanding and development of what is undeniably an invaluable character trait; one that all decent people- Christian or not, female or not- desire to have. Do I need to mention that I realize one person is not representative of an entire religion? Because I do realize that. I also recognize that this is not the first Christian I know to post something similar lately. In fact, I've also been noticing more and more Christians, both Mormons and those of other denominations, failing to take a stand on the high moral ground they claim, and failing to speak out for the values and beliefs they profess to uphold. It's true, I might be extra critical. And it's true, I do have high expectations for a church that carries the name of Christ; a church that I have tried very hard to find my place in. In the wake of the election and early weeks of the reign of terror- er, Trump, I've found more and more to criticize, and felt less and less like there's a place for me. The thought came to me this morning that maybe the problem isn't with the church after all. Maybe it's me. I have been struggling to find my place, when in reality, perhaps the reason I couldn't find it is simply because it isn't there. Maybe (here's where I stopped to take a breath because I'd yet to take one since making this discovery), maybe I'm not really a Christian. It was a bit shocking to consider, initially. I mean, even as I've begun to distance myself from Mormonism in small ways, I've still claimed Christianity. I've claimed it in the way you do when someone from another state asks where you're from, and you tell them the closest major city instead of the small suburb you actually live in. Then it's like, "Oh, Christianity. I've heard of it," and you're spared having to answer for the nuances of your little town when you really don't have answers yourself. Now I'm not so sure I can claim to live anywhere near that city. 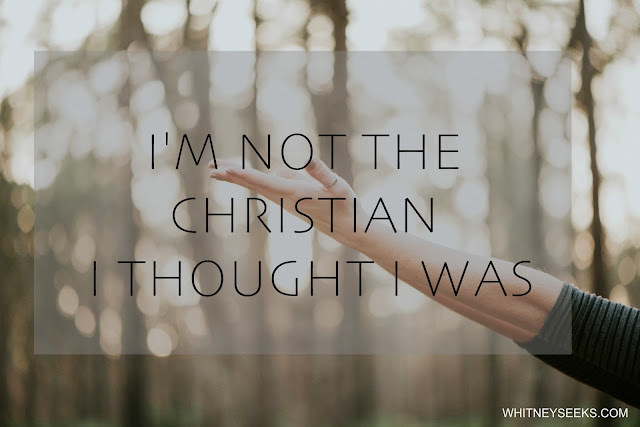 I still believe in God, and in Christ and his ministry, but the similarities end there. It's all a bit surreal to me because I thought we were on the same page for so long. See, I believe in families. I believe in fighting to keep them together when war and executive orders are tearing them apart. I believe that families are important and know there is more than one way to create one, none of which are wrong or less than. I believe in creating strong families, should you decide to have one, nurturing children, and protecting family values. Were I a true Christian (based on what I see at large), my priority would be fighting like hell to protect my family of one man, one woman, and three children from the threat of families that are led by two men or two women, and anyone with a child born outside of marriage. I believe that life is sacred. I believe that access to healthcare to care for said life is a right not a privilege. I believe that anyone responsible for the life of a child deserves support, not judgement. I don't believe that a life is more or less valuable because of gender, race, language, religion or lack of, ability, sexual orientation, address, school district, or income. I don't believe that a single life is expendable. Full stop. Were I a true Christian (again, as seen demonstrated by a majority), I'd have realized by now that I should be fighting for unborn children to be born and not concern myself with how they will survive, much less thrive once they're in this world. I believe women are important. I believe they are underestimated, infantilized, and all too often made to believe that their one purpose is to have children. I believe motherhood is amazing, but know it is not synonymous with womanhood. Were I a true Christian woman, I'd keep my mouth shut and be happy to be put on such a high pedestal (through words only, of course). I'd stop dreaming, stop fighting, and certainly wouldn't imagine teaching my children to dream or fight. I wouldn't believe I'm treated less than, because I'm told I'm not and I should know better than to question those I'm supposed to trust. I believe in prayer. I believe in fasting. I believe all the faith in the world means nothing without action. Were I a true Christian, my thoughts and prayers would be enough to solve all the problems of the world, leaving me with time to criticize the methods of those who choose to take action. I believe in having faith. I believe in standing for what is right and for what I believe in, even when I'm standing alone. I believe in integrity. Were I a true Christian, I'd be able to see how the president of the country I live in believes in and embodies the very same ideals, and well... I don't see it. I don't see any of it. While there are those who can, and do, use their religion to do good, I guess I'm just not able to reconcile what it takes to be a true Christian with what I believe in my heart and soul. I've been called intolerant, both directly and in a passive-aggressive, "you're just as intolerant as the people you say are intolerant" sort of way. The thing is, I never said I was tolerant. Tolerance is not love. Tolerance is not acceptance. You tolerate a coworker cooking fish in the shared office kitchen. You tolerate someone kicking the back of your seat on an airplane. Tolerating someone who is different from you and calling it acceptance will never bring anyone together on a level that really matters. Christ did not tolerate others. He went out and loved them. He served them. He wept with them. He taught them. And (if I'm reading from the same bible as those who tell me I need to be more accepting of intolerant opinions) when he needed to, he flipped tables. I'm not striving for tolerance. I'm striving for a radical love and a relentless pursuit of what is right and true. You can write down every good and valiant effort I make for the next ten years. It won't come close to what Christ did in a week- I know this, but it doesn't change anything. I'm still going to trust in God. I'm still saved daily by the same grace that promises me eternity. I'm still going to care deeply. I'm still going to stand for those who often stand alone because I know what that's like. I'm still going to raise my voice in solidarity with those who feel they don't have one. I'm still going to work for those who have to ask and fight for the same rights so freely given to others. If this means that I no longer get to say I'm from the booming metropolis of Christianity, so be it. I'm okay living on the outskirts of town.